Saint Aloysius had four great devotions in his daily life: the first was, as mentioned before, to Our Lord in His Real Presence in the Most Blessed Sacrament. Indeed, it is a special wonder in the Providence of God this year, 2015, that the feast of Saint Aloysius Gonzaga is commemorated secondarily today, the Fourth Sunday after Pentecost. Four hundred twenty-four years have passed since his death. The brightness of his love for Our Lord in His Real Presence still illumines the path of those First Communicants, who are given Saint Aloysius as an example to imitate as they prepare to receive Our Lord for the first time in Holy Communion. How fitting it is that both Pope Benedict XIII and Pope Pius XI declared Saint Aloysius Gonzaga, S.J., the patron of youth. Saint Aloysius Gonzaga, S.J.,pra for us. 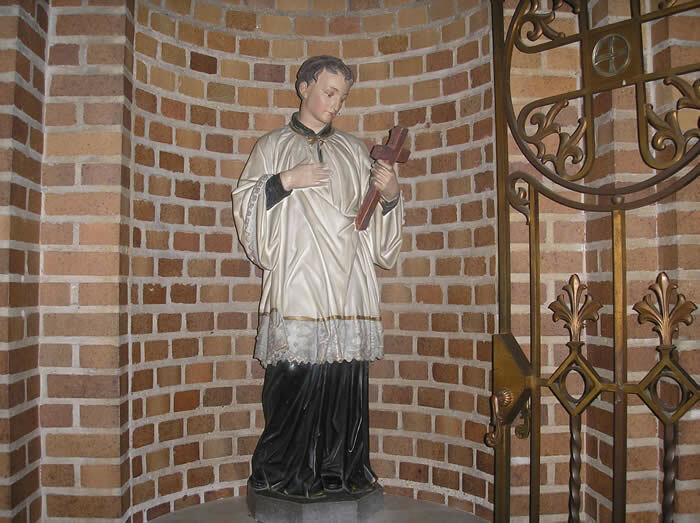 Statue of Saint Aloysius Gonzaga, Saint Aloysius Church, Great Neck, New York, November 24, 2007.